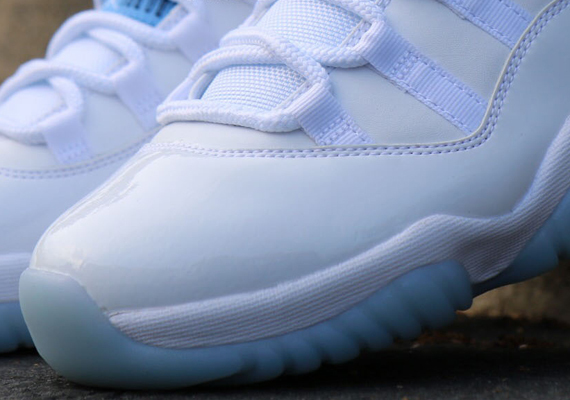 At long last Air Jordan enthusiasts will get another chance at the Air Jordan 11 “Columbia”. This year’s pair come with an asterisk in that it’s been rumored that the officially associated color is “Legend Blue” – but we’ve still not seen any box tags confirming that speculation. What we have seen are plenty of advanced looks at them, another one of which is available now. As you can see, the soles here look particularly milky, which is sort of a departure from the icy blue shade we’ve grown used to in recent years. Take a look at them after the click and tell us in the comments if the Air Jordan 11 “Legend Blue” is a must have for you.